Running a red light can cause serious injury, or worse, a fatality for Massachusetts drivers. If you see a light turning yellow as you approach the intersection, stop at the light rather than risk causing a Boston car accident. 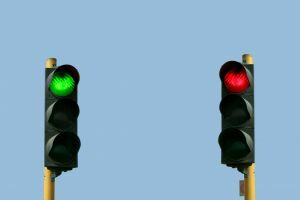 A 2006-2008 report from Southeastern Regional Planning & Economic Development District (SRPEDD) shows that red light running is on the rise. In fact the number has doubled from the 2002-2004 report. SRPEDD’s mission is to improve transportation safety. They identify dangerous roadways and intersections, and come up with a plan to make corrective measures. Their efforts are paying off as seven intersections had improvements made from 2000-2007. Before and after data showed a 52% crash reduction. During 2002-2004 there were 618 crashes caused by red light running. In the next two years that number ballooned to 1,287. -GAR Highway (Rte. 6) & Faunce Corner Rd. & Old Westport Rd. -Alden Rd. & Bridge St.
Red light running crashes account for 25%, 31% and 38% of all crashes at the above locations respectively. Sadly, two of these intersections are also ranked among the top 100 worst in Southeastern Massachusetts. Not only do you need to fear crashing into other vehicles when running a red light, you have to fear hitting pedestrians as well. In October, a paralyzed stroke survivor was crossing a busy intersection in his motorized wheelchair when he was struck by a van and pronounced dead at the hospital later that evening. Common excuses for running a red light include a driver going too fast as they approach an intersection, an impatient driver not wanting to wait for another full cycle of the light to turn green again, or a vehicle following too closely to get stopped in time for the red light. No matter what the reason, it is never a good idea to run a red light and risk the chance of serious injury to you or another person. If you are someone you love have been involved in an automobile accident in the Boston area, contact the Law Offices of Jeffrey S. Glassman for a free consultation. Call toll free at 877-617-5333.